In an industry where tribute bands can some times over run the club scene, it's always a pleasant surprise when you have the opportunity to see multiple groups of musicians all paying tribute to the same band. Case in point, AC/DC. The legendary Australian band has influenced many youngsters to pick up a guitar and learn 'Highway to Hell' or 'Back in Black'. The familiar SG and schoolboy outfit are key components when a group of friends decide to form a band to honour the Aussie legends. 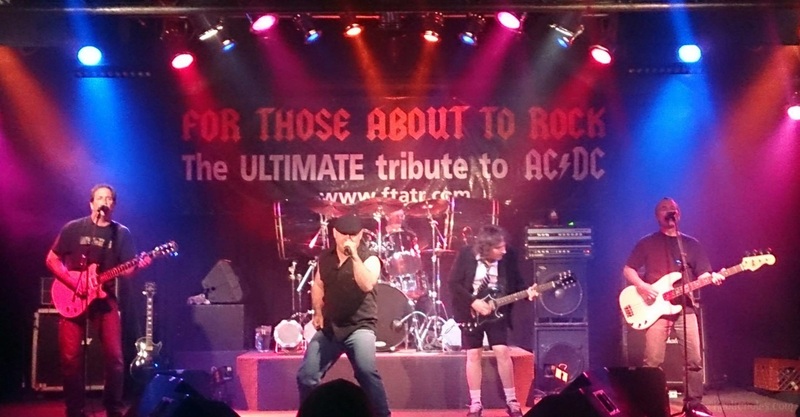 Over the past few months, I have had the honor of seeing some incredible AC/DC tribute bands. Most recently, a trip to London, Ontario served as the backdrop for a show by 'For Those About To Rock' (FTATR). My usual ritual of researching a tribute band before attending their show resulted with a trip to their official website. The site is very well designed and offers an abundant amount of information, ranging from gig dates, band bios, fan feedback, media and the one area that caught my eye was the setlist tab. As I was reading the list, which is broken up by era (Bon Scott & Brian Johnson), a few songs instantly jumped off the screen at me. 'Ride On', 'Night Prowler', 'Big Balls' to name a few. Previous outfits we had seen, did not include those hidden gems, so I was extremely eager to get to this show in hopes of hearing those songs. I must admit I did reach out to the band and inquire about 'Ride On' and 'Night Prowler' being included for their show Friday night. I was informed that 'Ride On' does remain on the setlist, as vocalist James Pritchard says "That's my chance to NOT scream at everyone for five minutes." As for 'Night Prowler', while it had been included in previous setlists, he indicated he would try to have it added. With that, the eve of the show arrived and we were off to Eastside Bar & Grill in London to see 'For Those About To Rock'. Eastside Bar & Grill is actually quite a cool place. It was surprisingly larger inside than what you would think from the outside appearance. The staff were friendly and welcoming, which made our time there enjoyable. It would definitely be a great place to go back to again. The first thing we saw was the amazing stage set up. Of course, you couldn't ignore the giant banner hanging above the drumset. The stage was slightly elevated off the floor. There was a fair size dance floor between the stage and the first few tables. The guys continued to set up before running through a couple songs for soundcheck. The lighting, which was jointly supplied by the band as well as the venue was extraordinary. The red and blue spotlights provided a dramatic effect throughout the night. The spotlights located near the drums were a great touch, and came in handy at the end of the night during 'For Those About To Rock', which paired nicely along with the cannon sound effects that were on hand for the song. Once guitarist Rob Kowalishen took the stage, in complete schoolboy attire, it was time to start the show. The opening riff of 'Stiff Upper Lip' echoed throughout Eastside's. It sounded amazing. Even more so once James began to sing. The challenge for any AC/DC band, who decides to take on the duty of covering both eras, is having a vocalist that can do justice to both the Bon Scott material as well as the Brian Johnson material. 'FTATR' are fortunate to have a strong singer in James. Born and raised in the Greater Toronto Area, James "Problem Child" Pritchard, has been fronting the band since 2003. After a night of karaoke, he was hooked on singing and began to learn AC/DC songs. Soon, he was being asked to perform the songs whenever he was out at the bar. The original drummer for 'FTATR' approached James and asked him if he was interested in playing and creating a tribute band. The rest they say, is history. In addition to fronting the band, James has also assumed managerial duties for the last little while. James was very friendly and approachable throughout the night. It was nice speaking with him, not to mention he was generous in giving us 'FTATR' tshirts during one of the breaks. He also had no problem rounding up the band to sign one of their promotional posters for me. With a dedication to Malcolm, the band began one of AC/DC's only slow numbers, and the song I was looking forward to hearing...from 'Dirty Deeds Done Dirt Cheap' - 'Ride On'. Fellow Toronto native, Rob "Riff Raff" Kowalishen, has over twenty-five years of experience. Having previously been in Lynard Skynard and Led Zeppelin tribute bands, he is more than just an incredible guitar player, but can proudly add luthier to his resume. He is the proud owner of a SG that he built and has used it during performances. It's awe-inspiring to see a guitarist wearing a schoolboy outfit on stage and playing some of your favourite songs. Rob excels in the role of Angus Young. Throughout the night, his energy and playing mesmerized everyone in the bar. At one point during the night, he left the stage, fell to the floor on his back and twirled himself around a couple times, then jumped back on his feet and returned to the stage all while never missing a note. He's an enthralling performer, and along with the theatrics, he encapsulates the spirit of both 'FTATR' and AC/DC. His playing during 'Night Prowler' was magnificent. That's not to say that the rest of the setlist wasn't, because he was on his game all night. 'Touch Too Much', 'Play Ball', 'Sin City', plus the rest of the three sets were spot on. Rob was also very friendly and welcoming. In charge of holding down the fort with his rhythm guitar playing is Al 'Big Balls' Boriska. Also calling Toronto home, Al is no stranger to AC/DC tribute bands. He was previously a member of 'Jailbreak', and he is also a founding member of 'FTATR'. Al went to highschool with Rob. Having previously played together, it was only natural that the two would become bandmates in 'FTATR'. Assuming the characteristics of the role he's playing, Al can duplicate Malcolm Young's stance and demeanor. His strong playing, as well as ability to provide impressive backing vocals, it's equally as entertaining watching him as it is the rest of the band. Al was friendly and it was a pleasure meeting him. Similar to AC/DC, it's a family affair. Eric 'Moneytalks' Kowalishen is lead guitarist Rob's brother. While playing rhythm guitar, he would fill in when required. When 'FTATR's original bass player moved out of the province, Eric was asked to stay in the band, assuming role of bass. He learned the material and for the past ten years now, he has been a vital member of the band. Eric's playing, along with the drums, are essentially the glue that musically holds the band together. Sometimes bass players are overlooked and underrated, but these 4-string players are responsible for anchoring the rhythm of any song. While he may not have the flash that his brother must display during the show, Eric's technique, along with his endearing demeanor make him a joy to watch and listen, as well as approachable to speak with after the show. He fearlessly approaches the mic to provide backing vocals, along with guitarist Al. The two complement each other and provide a strong rhythm section for 'FTATR'. You can't rely strictly on bass and rhythm guitar to provide a solid back beat to your band. That's where the drummer earns his title of the beat keeper. For 'FTATR', that honour goes to Jim 'Thunderstruck' Campbell. A Toronto native, he is the only non-original member of the band, but after seeing him perform the other night, there's no denying that he is a core member of the band. In the short time he's been with the band, Jim has brought precision, power, and great technique to 'FTATR'. I was instantly impressed with the setup of his drums. Located on either side of him, is a 22" bass drum, resembling Chris Slade's current kit set up that you can see on AC/DC's current tour. Aside from controlling the beat of the band throughout the sets, Jim also is in charge of the sound effects, namely the bell for 'Hell's Bells' and cannon explosions for 'For Those About To Rock'. He also controls the lights that belong to the band, located on the stage around his kit. He also attended the same highschool as Rob and Al, and even played in some of the same tribute bands as Rob. So it really is like a family affair, a group of brothers. Jim was very friendly and accommodated my request for autographed drumsticks. Thanks so much Jim. The night that included three sets of non-stop, fun, rock and roll sadly came to an end way too soon. Time sure does fly when you're having a great time. It was nice to wait around at the end of the night, and speak to the guys, thanking them for a wonderful time. Playing the hits, along with the hidden gems that the die-hard AC/DC fans know and love, made for an enjoyable night. It was compelling to see how a group of hard working, talented musicians approach the music and execute it with great precision and skill. They appeared to really enjoy what they are doing, and they excel in their roles. 'FTATR' formed in Toronto during the fall of 2003. Throughout the years, they have played numerous places, had personnel changes, all while keeping true to the music. The chemistry that these men have, is evident in their performances. It was a great honour having the opportunity to see them in London. I would highly recommend them if they are playing in your area. I look forward to seeing them all again in the near future. Special thanks to James, Rob, Eric, Al and Jim for a great night, for the souvenirs and for being very welcoming, friendly guys. To keep up with 'For Those About To Rock', be sure to Like them on Facebook and bookmark their official website.